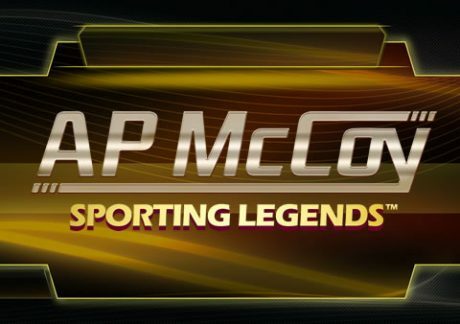 With the horse racing calendar currently suspended until next Wednesday because of an outbreak of equine flu, lovers of the sport of kings who still need their racing fix can look no further than the brand-new AP McCoy: Sporting Legends video slot. Part of the Sporting Legends series from Playtech, it’s a 5 reel, 243 ways to win video slot that comes with some cracking extras. As you’d expect given its name, the 20-time champion jockey features heavily in this game. You’ll see him in various symbols on the reels as well as an animated version which guides you through the bonus wheel options. To trigger the Bonus Wheel feature, you’ll need to land the bonus symbol on reels 1, 3 and 5 on the same spin. You’ll then be awarded 10 free spins but can land more depending on where the bonus wheel lands. The wheel can also deliver cash prizes of up to 1,000 times your betas well as bringing multiplier wilds into play which can send payouts rocketing by up to 7x. These can combine to give you multipliers up to 49x! You’ll also have the option to play in Power Play mode which is a series of 5 linked spins where any winnings from a spin are carried through and added to anything you might win on a later spin. For example, say you won £1 on spin 1 and £5 on spin 4. If you land a winner on spin 5, you’d receive £6 (the £1 and £5 from the earlier spins) plus whatever amount you won on the final spin. Up your stakes even more to play in Accumulator Plus Power Play mode. The accumulated payouts are in play when this is live along with extra wilds. You’ll also receive a Super Spin at the end of the round when all of the collected wilds are added to the reels for 1 final spin. It’s not a cheap option but if the wilds work their magic, it can be worth a go. AP McCoy: Sporting Legends is part of the Sporting Legends Jackpot Network which means you’ll also have a chance to land a potentially bumper progressive prize. There are daily, weekly and a Mega Jackpot to be won. These can strike at random on any spin. The Mega Jackpot is worth over £621,000! 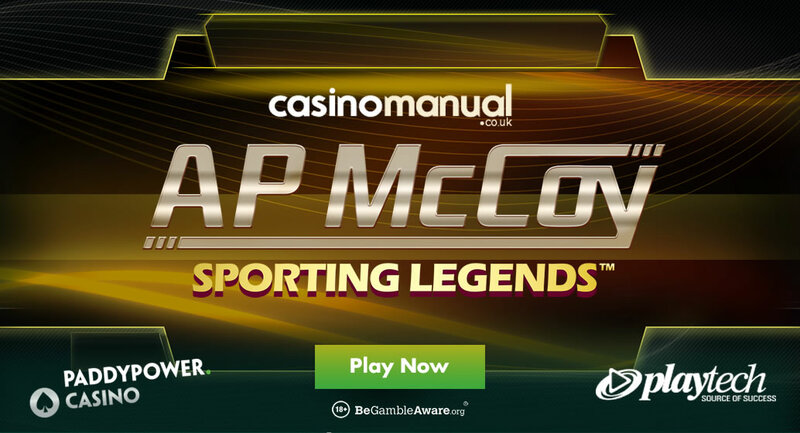 It’s not the most elegant looking video slot you’ll see but if you’re a racing fan, then it’s well worth getting under starter’s orders with AP McCoy: Sporting Legends. You can play AP McCoy: Sporting Legends at Paddy Power Casino – you have a choice of 2 welcome offers when you join. Deposit just £10 to get a £40 bonus and 20 wager-free free spins. You can also opt for a 200% match bonus up to £200 – i.e. deposit £100 to get a £200 bonus. If you’re a horse racing fan, you also have Frankie Dettori: Sporting Legends.